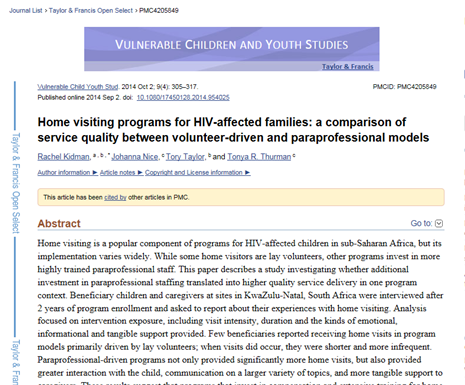 Home visiting programs for HIV-affected families: a comparison of service quality between volunteer-driven and paraprofessional models investigated whether or not additional investment in paraprofessional staff translated into higher quality service delivery. The study, conducted in KwaZulu-Natal, South Africa was conducted over a two-year span. The results suggested that compensation and extensive training programs for home visitors are better able to serve and retain beneficiaries than volunteer home visiting programs.